How Do I Know If My Child's Anger Is Normal? Anger is an adaptive and harmless emotion that every child experiences. Anger is an important emotion as it provides information to children about when they are being wronged. Youth learn to assert themselves through experiencing anger and by learning to regulate this emotion. Therefore, the adaptive expression of anger is an important skill that develops throughout childhood. In this sense, there are expected differences in the way anger is regulated and expressed based on the child’s developmental level. For example, when children are very young, their anger may be expressed through tantrums, which often include crying, screaming and minor aggression. In older children and adolescents, a child’s anger may present as irritability. This is usually evidenced by frequent arguing or talking back to adults or by withdrawing from others when upset. There are certain times in development when parents can expect to see increased anger in their children. For example, when children are between the ages of one to three years old they may present with increased tantrums. When youth enter into adolescence, they may also show increased anger, often directed toward parents. In fact, studies have shown that on average, teens and parents experience conflict approximately 20 times each month. When should I be concerned about my child’s anger? The expression of anger is developmentally inappropriate. This usually presents as tantrums occurring later on in childhood. The child’s anger is accompanied by aggression (such as hitting, kicking, biting or punching) or destruction of property. This is especially concerning in older youth and adolescents. The child experiences anger with great frequency. He or she may present as irritable or angry more frequently than not. The child’s anger reactions are of great intensity and present as disproportionate to the situation that triggered the anger. The youth’s anger and accompanying emotional reactions last for extended periods of time and may not resolve even when the cause of the problem has been addressed. The frequency and severity of anger responses are distressing to the child or interferes with his or her functioning. Why is my child experiencing difficulties managing his or her anger? 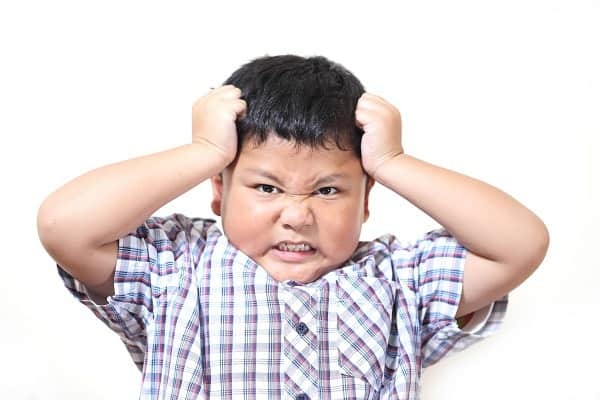 Difficulties with anger regulation are common in various psychological disorders including Attention Deficit Hyperactivity Disorder, Conduct Disorder, Oppositional Defiant Disorder, Mood and Anxiety Disorders, and Autism Spectrum Disorder. However, anger difficulties can occur in youth even when there is not a related diagnosis present. Significant anger difficulties rarely resolve on their own and can often lead to a number of academic and interpersonal difficulties. Anger concerns can be addressed by treating any underlying disorder and also through cognitive behavioral treatment focused on teaching adaptive emotion regulation skills. This treatment modality typically involves both parents and children. Sessions generally involve identifying the child’s triggers for anger, identifying their current responses to anger and coming up with alternate responses, such as taking breaks before trying to address the issue. Depending on the age of the child, treatment also involves identifying and challenging any associated maladaptive thought patterns.